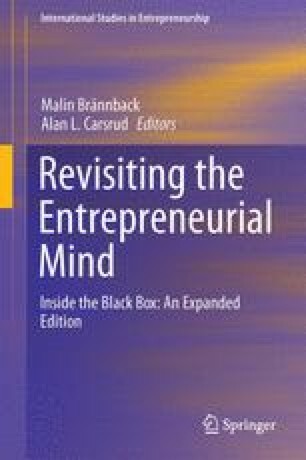 Since the original chapter on entrepreneurial motivation by Carsrud et al. (2009), we have seen dozens of citations to the work and to a follow-up article (Carsrud and Brännback 2011) in various conference papers and published research articles. We are gratified to see the motivation of entrepreneurs regaining some of the attention of researchers (Shepherd et al. 2015). In this update to the chapter, we are going to focus on some of the work, which we feel has the most promise of influencing the future direction of research on entrepreneurial motivation. We also have discussed motivations in an earlier update in this volume on a contextual model for entrepreneurial intentions. These specifically focused on our views on the role of motivations and goal setting with respect to intentions. In this update, we will expand on that and other issues, which we feel deserve attention.